A great way of using up bananas that are past their best! Put peeled bananas into the freezer and leave them until they are frozen. Melt some leftover chocolate, then leave it to cool down (don't let it set). 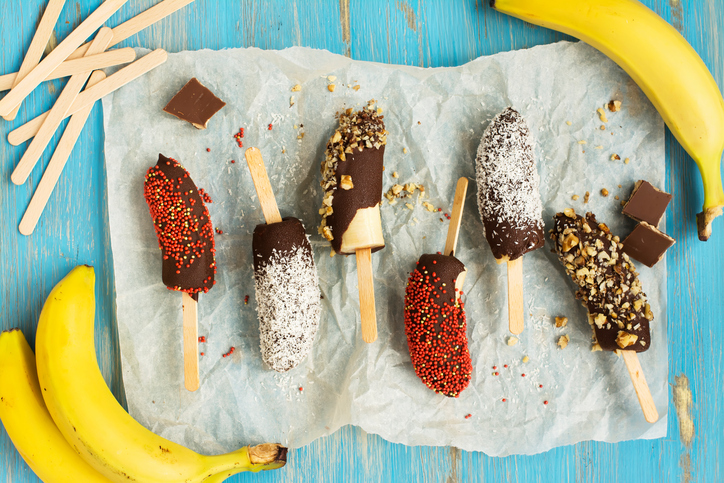 Take the bananas out of the freezer and while they are still frozen, cut them in half, then poke a wooden lolly stick into the end of the banana (to make a lolly). Coat the banana with the cooled chocolate and put on any decorations/sprinkles, then allow the chocolate to set. Wrap the bananas in clingfilm, place them in a freezer bag and freeze. Wait until they are frozen before you eat them!